I printed a logo I found online, and die cut that for my stopper - it worked pretty well on a piece of foam tape. Some people had trouble finding the 15 mm rings - I got these ones from Amazon. They're a little heavier wire, so you'll need 1/8" holes instead of 1/16", but they worked fine otherwise. 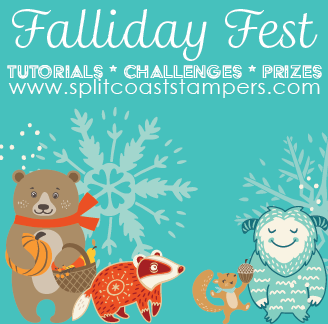 Come over to the Falliday Fest Challenge Forum for all the details! If you've been playing along with us, THANK YOUUU!!! It has been so much fun. Love this, Dina! Lucky hubby!! !